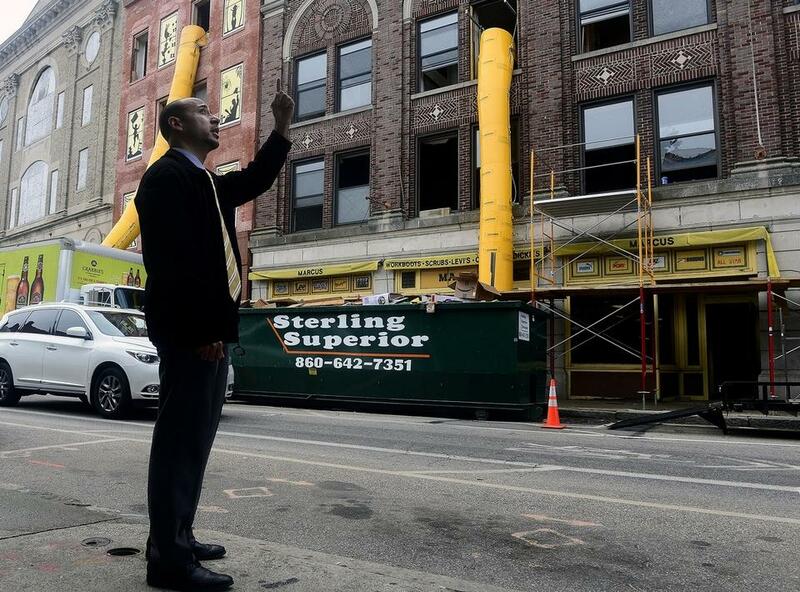 New London — Downtown developer Eric Hamburg strides out of the second-floor office of Felix Reyes on Wednesday afternoon with a rolled-up set of blueprints and stack of file folders clutched under one arm. Hamburg recently closed on 74 State St., the former Mallove’s Jewelers, adding a fifth building to his collection in the heart of downtown. He’s considering a restaurant for the corner of Bank and State streets, with water-view apartments above. His initial plans for the former Capitol Theater on Bank Street are a mix of apartments, restaurants and an indoor market. Hamburg said obstacles remain but he cracks a smile when asked about his confidence in getting his projects completed and waves a thumb in Reyes’ direction as if to indicate Reyes will be an important player. Reyes, the city’s new director of economic and community development, exudes confidence and optimism. It appears to be contagious. Reyes says he has reason to be optimistic. On Thursday, he and Mayor Michael Passero met with some of the major players in the off-shore wind industry. State Pier is attracting attention and Reyes said the city needs to be able to work with whatever industry is looking to set up shop. Later that night, the Planning and Zoning Commission approved plans for a 98-unit apartment complex on city-owned land at the corner of Bank and Howard streets, the long vacant former Parcel J. He said the same company that has pitched the development, A.R. Building Company, is filling up its most recent residential project at 60 Mansfield Road. Back in his office, Reyes sits at a table and traces his finger along a color-coded map of downtown buildings. He pops up from his seat and walks to a whiteboard to sketch a diagram and explain how many of the downtown buildings are physically interconnected, an example of why cooperation between property owners will be needed as a flurry of restoration work on the historical structures continues. Reyes, 36, took on the job of director of development and planning in March and said he has started meeting with downtown property owners to develop relationships during what he sees as a major boom in the development scene. Reyes, who lives in Trumbull with his wife and two young children, was traveling to Chicago every month at his previous job as a senior project manager with the development and construction management firm LendLease when he read about the departure of his predecessor, Tammy Daugherty. The position’s job duties were expanded to include a focus on policy recommendations, technical advisory services and development of long-term strategies for the city to be able to attract new businesses and development. The job description was right in his wheelhouse. A 1999 New London High School graduate, Reyes earned a degree in architecture from Wentworth Institute of Technology, kicked off his career at Barun Basu Associates in New London and moved on to several different companies in commercial real estate, planning, architectural design and construction industries. Among other accomplishments, he managed the build-out of 300 restaurants for Yum Brand, the renovation and development of 50 Citizens Bank branches and served as project manager and architect for capital improvements at the Merit 7 Corporate Office Park in Norwalk. Reyes never really disconnected from New London or its sports teams. His parents still live here and he has been visiting several times a month. “I’m very much attached to the neighborhoods, the culture,” he said. His phone “blew up” when his hiring was announced by the city. Everyone he knew from school contacted him to express their congratulations, he said. As for the work ahead, Reyes said he has his hands full. He has a staff of 12 between the Building and Planning and Zoning departments and is helping to craft a job description for the next economic development director, a position that has remained vacant since the retirement of Ned Hammond. Part of his work will be to modernize the Building Department, a group he said is composed of experienced professionals using antiquated technology. He intends to change that and computerize most of the paperwork to become more efficient. As for blight, Reyes said the downtown property owners will have noticed an increase in citations over the past few months as the city ramps up its efforts to get properties into compliance with the property maintenance code and look presentable. He’s aware construction Dumpsters line a portion of Bank Street and several buildings are encapsulated by scaffolding with chutes hanging out of open windows. Most of the work to date has been demolition and owners taking stock of what they have, he said, which is necessary if the buildings are to be renovated. One developer he has yet to meet with is Bill Cornish, someone who he said is critical to the success of the downtown because of his vast holdings. His office has received complaints, he said, about the state of Cornish’s buildings but will reserve judgment, he said, until he understands whether Cornish has an overall plan. Historical buildings are being scooped up by developers at a dizzying pace and Reyes said his plan is to help guide the work so the projects are completed. Industrial Renaissance is a principal investment and operating firm in business since 1996. Industrial Renaissance is unique in the private equity, venture capital, and mergers and acquisitions industry – we are not a private equity fund or venture capital fund. We are a team of seasoned operators and business executives. We invest our own capital with participation from a select group of long-term investors. Unlike the private equity, venture capital, and mergers and acquisitions industry, we do not charge investors management fees. Our business mission is to buy and build large, dominant, successful businesses. We are not buyers and sellers of businesses. We buy to build businesses. We are, and will remain, highly unique in the private equity, venture capital, and mergers and acquisitions industry. Copyright © 2019 Industrial Renaissance, Inc.. All rights reserved.